A screenshot from the Budweiser ad. 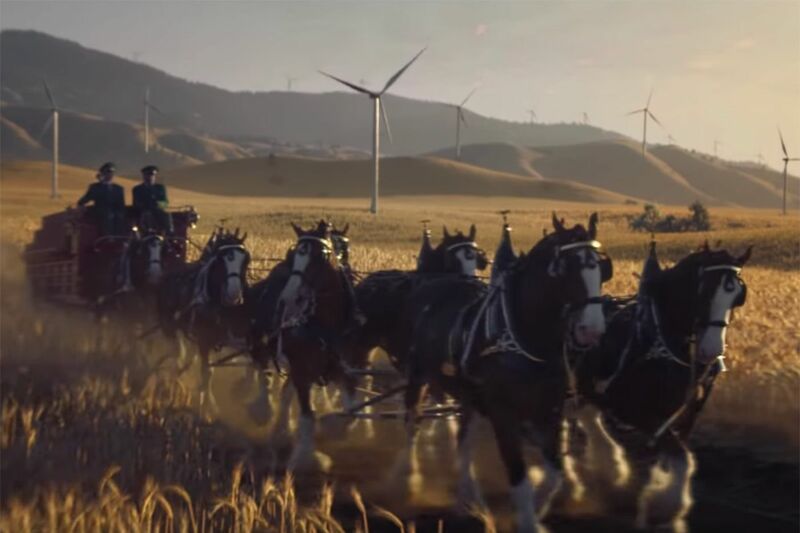 No, the Budweiser wind farm ad wasn’t among the top five highest rated Super Bowl commercial’s for 2019, according to USA Today’s Ad Meter. That honor went to the NFL’s ad celebrating the league’s 100th anniversary. Nor, was it among the top five lowest. But it’s been a winner among online viewers since first debuting on Jan. 23, though it’s not been a favorite of the fossil fuel industry. In the one-minute commercial, the camera zooms out and the Dalmatian is seen riding atop an old-fashioned wagon drawn by the beer company’s iconic Clydesdales through a wheat field. Mountains dotted with windmills emerge in the background. The ad is not as clever or dramatic as the dragon-themed Bud Light and Game of Thrones mashup commercial that drew lots of attention. But it manages to be simple and nostalgic while demonstrating that at least one big corporation believes renewable energy has a mainstream U.S. audience — despite President Donald Trump’s doubts that human activity causes climate change and his administration’s pro-fossil fuel stance. As of Monday afternoon, the commercial had been viewed 18.3 million times on YouTube. By comparison, the official Bud Light and Game of Thrones/HBO “worlds collide” video had been viewed about 3 million times, though it had not been released until Sunday. Budweiser, owned by the multinational corporation AB InBev, says it is committed to brewing beer with clean energy through an arrangement with a 60,000-acre, 300-megawatt Thunder Ranch Wind Farm in Oklahoma. AB InBev says it has committed to purchasing 100 percent of its electricity from renewable sources by 2025. The company also owns Bud Light, Busch, Stella Artois, Corona, Modelo and Lowenbrau, to name a few of its 100 brands. AB InBev is headquartered in Leuven, Belgium, but also has a main office in New York. Wind Power Monthly reported in 2017 that, under the power purchase agreement, Enel Green Power, an Italian company that owns Thunder Ranch, will sell about half the electricity generated from the farm to the power grid for AB InBev to purchase. That would enable the brewer to access enough renewable energy to cover half of its energy use in the U.S. The Energy and Policy Institute, which describes itself as a watchdog against misinformation on renewable energy, said the ad has been attacked by The Kentucky Coal Association and the website ClimateDepot.com, which is aided by a coal-backed group. The Kentucky Coal Association says Budweiser is still brewed with mostly fossil fuels. Two-thirds of the energy used to brew the beer comes from industrial heat, not electricity, the association says, based on Anheuser-Busch’s own literature. Industrial heat comes from “a mixture of energy sources including natural gas.” The association called Budweiser’s ad a publicity stunt. Last week, Tony Milikin, chief procurement and sustainability officer of AB InBev, told Reuters he knows consumers are often skeptical about corporate environmental pledges. But he said that AB InBev expected to obtain 31 percent of its electricity this year from renewable energy and is still on track to obtain all of its electricity from renewables by 2025. The company plans to add a “100 percent renewable electricity” symbol to U.S. bottles and cans.